Palynology (2018) 42 (0): 162-181. Despite the fact that dinoflagellate cysts of the diverse genus Spiniferites are abundant in coastal and estuarine sediments worldwide, little is known about patterns of their seasonal or annual production. In this paper we review previously published data on Spiniferites cyst fluxes from eight sediment trap time series in estuarine (the Strait of Georgia, Saanich Inlet, Hudson Bay, Omura Bay), coastal (the Santa Barbara Basin, the Arabian Sea), and offshore (off Cape Blanc) environments. This is the first study that provides detailed inter-site comparison of dinoflagellate cysts in sediment traps and analyzes seasonal, annual, and inter-annual cyst production from different geographic regions. We identified that cyst fluxes of all Spiniferites species at a given location increased or decreased simultaneously in all studied sediment trap records. This indicates that different Spiniferites species react in a similar way to local environmental triggers at each site. Average daily total cyst fluxes recorded in the sediment trap time series and in the dated surface sediment samples are greater in coastal and estuarine waters where marine primary productivity is higher. This implies that nutrient availability might be an important factor stimulating Spiniferites production. There is no uniform seasonal pattern in Spiniferites fluxes, but the timing of elevated total Spiniferites fluxes coincided with intervals of local seasonal environmental change at each site. Analyses of all sediment traps revealed that intervals with the highest total Spiniferites fluxes correspond to the timing and intensity of local environmental change at the sea-surface when waters had: minimal turbidity, some water column stability or stratification, availability of nutrients, and sea-ice free conditions. The multi-year trap data record considerable inter-annual variability in Spiniferites fluxes and seasonality when environmental conditions between the years varied. A combination of factors and specific environmental conditions are required to enhance Spiniferites cyst production in each region. Sediment traps are sampling instruments that are used to collect particles falling through the water column to the sea floor (e.g. Buesseler et al. 2007; Honjo et al. 2008). They allow for the amount of material that surface waters transport to the deep ocean and sediments to be directly estimated (e.g. Thunell & Reynolds 1984; Fischer et al. 2003; Johannessen et al. 2005). In addition, sediment traps can provide continuous long-term monitoring of phytoplankton dynamics, especially when sampling intervals are adequate in duration and frequency. Such studies are essential to document seasonal and multi-annual changes in phytoplankton production, particularly where phytoplankton monitoring is sporadic or virtually absent. Over the last few decades there has been an increase in the number of high-resolution sediment trap studies of phytoplankton (e.g. Fischer et al. 2002; Sekula-Wood et al. 2011; Koebrich et al. 2016). However, these studies are still rather limited in number and location, and they rarely contain phytoplankton census data, especially on cyst producing dinoflagellates. Dinoflagellates are one of the major groups of phytoplankton, accounting for a substantial amount of the planktonic biomass (Taylor 1987). Some dinoflagellates are phototrophic and contribute directly to primary productivity (e.g. Dale 1996; Jacobson & Anderson 1996), whereas others are heterotrophic, feeding on bacteria, nanoflagellates, hapto- and prasinophytes, other dinoflagellates and diatoms (e.g. Jacobson & Anderson 1996; Jeong et al. 2005, 2008, 2010). It is believed that the majority, if not all, of phototrophic dinoflagellates can be mixotrophic, able to photosyntheze and to ingest prey (e.g. Jeong et al. 2010). Therefore, dinoflagellate distribution can be influenced by a number of biotic and abiotic factors, such as sea-surface temperature (SST), salinity (SSS), light availability, nutrients, turbidity, prey availability, and grazing (e.g. Harris 1986; Taylor & Pollingher 1987). During their life cycle, some dinoflagellates produce organic-walled resting cysts that are fossilizable (e.g. Fensome et al. 1993; Dale 1996). Therefore, accumulated in sediments dinoflagellate cysts encode information about past dinoflagellate populations in the upper water column and the environment under which they were produced (e.g. Dale 2009). This makes dinoflagellate cysts a widely used biological indicator of past environmental conditions (e.g. Rochon et al. 1998; de Vernal et al. 2001, 2013; Harland et al. 2006; Mudie et al. 2007,; Marret et al. 2009; Zonneveld et al. 2012; Pospelova et al. 2015). To refine such paleoenvironmental reconstructions and make cyst-based qualitative and quantitative estimates more reliable, patterns of resting cyst production and ecological conditions under which cysts are formed need to be studied directly by measuring in situ cyst production through sediment traps. To date, there have been very few studies that provide seasonal sediment trap series of organic-walled dinoflagellate cyst fluxes in the offshore (Dale 1992; Dale & Dale 1992; Harland & Pudsey 1999; Zonneveld & Brummer 2000; Susek et al. 2005; Zonneveld et al. 2010; Prebble et al. 2013), coastal (Montresor et al. 1998; Morquecho & Lechuga-Devéze 2004; Pitcher & Joyce 2009; Shin et al. 2012; Bringué et al. 2013), and estuarine (Godhe et al. 2001; Fujii & Matsuoka 2006; Pospelova et al. 2010; Howe et al. 2010; Price & Pospelova 2011; Heikkilä et al. 2016) settings. Out of these studies, only some were conducted over a year time period: the Gulf on Naples, Mediterranean Sea (Montresor et al. 1998); Bahia Conception, Gulf of California (Morquecho & Lechuga-Deveze 2004); Omura Bay, southwestern Japan (Fujii & Matsuoka 2006); Namaqua shelf, Benguela upwelling system (Pitcher & Joyce, 2009); off Cape Blanc, northwestern Africa (Zonneveld et al. 2010); the Strait of Georgia, Salish Sea, northeastern Pacific (Pospelova et al. 2010); Saanich Inlet, Salish Sea, northeastern Pacific (Price & Pospelova 2011); the Santa Barbara Basin, northeastern Pacific (Bringué et al. 2013); and east of New Zealand, southwestern Pacific (Prebble et al. 2013). To the best of our knowledge, there are only eight dinoflagellate cyst sediment trap time series that lasted at least eleven months and reported Spiniferites species with the timing of their production (Zonneveld & Brummer 2000; Susek et al. 2005; Fujii & Matsuoka 2006; Pospelova et al. 2010; Zonneveld et al. 2010; Price & Pospelova 2011; Bringué et al. 2013; Heikkilä et al. 2016). These sediment trap studies are from coastal and estuarine waters of North America (the Salish Sea, the Santa Barbara Basin, and Hudson Bay), Japan (Omura Bay), and Africa (off Cape Blanc and the Arabian Sea) (Figure 1). Despite the fact that species of the diverse cyst-based genus Spiniferites (motile equivalent: Gonyaulax) are very abundant in coastal and estuarine regions worldwide, seasonal and annual patterns of their cyst production are not well known. Thus, their relation to environmental conditions is still poorly understood. Spatial distributions and environmental tolerances of several Spiniferites species are well documented in extensive studies of surface sediment samples (e.g. Zonneveld et al. 2013). However, these studies are based only on Spiniferites relative abundances in total cyst assemblages and information on cyst sedimentary fluxes is rarely available. In general, surface sediment samples represent the last several years to decades of deposition, and are unsuitable for determining seasonal and inter-annual patterns in cyst production that may vary on a regional scale. Thus, there is a need to identify Spiniferites seasonal and inter-annual production through sediment trap studies at a daily-to-monthly temporal resolution. In this paper, we review previously published annual and multi-year sediment trap studies that document seasonal, annual, and inter-annual dynamics of cyst fluxes of individual Spiniferites species. By comparing such data from eight geographically distant locations we aim to identify seasonal variations in Spiniferites spp., S. bentorii, S. bulloideus, S. elongatus, S. hyperacanthus, S. membranaceus, S. mirabilis, S. pachydermus and S. ramosus fluxes, as well as to refine ecological conditions under which they are formed in coastal and offshore environments. To verify if the main patterns of cyst production, determined from the trap studies, are reflected in surface sediment samples, we compare our results with previously published Spiniferites fluxes in surface sediments. Establishing seasonal and inter-annual trends of Spiniferites cyst production and identifying their geographical patterns will allow further tuning of the dinoflagellate cyst method for high-resolution proxy-based reconstructions. Spiniferites time series from eight geographically distinct areas in the Northern Hemisphere (Figure 1) were retrieved from previously published results (Zonneveld and Brummer 2000; Susek et al. 2005; Fujii & Matsuoka 2006; Pospelova et al. 2010; Zonneveld et al. 2010; Price & Pospelova 2011; Bringué et al. 2013; Heikkilä et al. 2016). Four sediment traps are from estuarine waters of the Salish Sea (the Strait of Georgia and Saanich Inlet), Omura Bay and Hudson Bay, whereas the other four traps are from offshore waters that are influenced by coastal upwelling off Africa (off Cape Blanc and the Arabian Sea) and North America (the Santa Barbara Basin). A summary of sediment trap and mooring site information for all eight traps is provided in Table 1 and their locations are shown in Figure 1. Since all sediment traps are from the Northern Hemisphere, we define seasons as winter from December to February, spring from March to May, summer from June to August, and fall from September to November. Potential issues with site-specific sediment resuspension and/or time lag due to vertical or lateral transport were addressed in the original publications, where they were found to be minimal or negligible for the traps (Zonneveld & Brummer 2000; Susek et al. 2005; Fujii & Matsuoka 2006; Pospelova et al. 2010; Zonneveld et al. 2010; Price & Pospelova 2011; Bringué et al. 2013; Heikkilä et al. 2016). One of the world’s longest and most continuous moored sediment trap sites is located offshore in the Cape Blanc region, the northwestern Africa (Figure 1) (Fischer et al. 2009). Along this coast, upwelling is maintained throughout the year by the steady presence of northeasterly trade winds, with their maximum intensity in spring (April–June) and fall (September–October) (e.g. Schemainda et al. 1975; Fischer et al. 1996). Suppressed SSTs generally correspond to stronger trade winds and upwelling intensity, with the latter resulting in high primary productivity (e.g. Fischer et al. 1996; Susek et al. 2005). The sediment trap location can be occasionally reached by large filaments and eddies that bring upwelled coastal waters offshore. At this site dinoflagellate cyst fluxes were analyzed from March 1989 to November 1991 (Zonneveld et al. 2010) and from June 1998 to November 1999 (Susek et al. 2005). During the studied period, SST varied from 18 to 24 °C and SSS stayed at ∼36 psu (Susek et al. 2005; Zonneveld et al. 2010). Sampling intervals ranged from 7 to 28 days, averaging 18 days (Table 1). The Arabian Sea is strongly influenced by semi-annual reversing monsoons. The southwest summer monsoons normally blow from May to September and the northeast winter monsoons prevail from November to February (Warren 1966). The southwest (SW) monsoons trigger upwelling along the coasts of Somalia and Oman (McCreary et al. 1996), resulting in the subsequent drop in SST and the injection of nutrients into the euphotic zone. In contrast, during the inter-monsoonal periods and the northeast (NE) winter monsoons no upwelling is present along the Somali coast, and the upper waters are stable, leading to low primary productivity in the region. The time between the monsoon seasons is characterized by a 180° change in the wind direction that corresponds to a large oceanic circulation transition in the tropical Indian Ocean (Warren 1966). Spiniferites fluxes from the NW Arabian Sea were recorded in two sediment traps moored in the Somalia Basin from June 1992 to February 1993 (Zonneveld & Brummer 2000; Figure 1). One sediment trap was positioned closer to the shore and near the shelf break (MST-8), whereas the other one (MST-9) was moored ∼200 km to the east. At both sites SSTs were cooler (∼19 to 21 °C) from June to September 1992, indicating an increase in the coastal upwelling and weaker water column stratification during this period. Sediment trap sampling intervals were 7 and 14 days, with an average of 12 days (Table 1). The Santa Barbara Basin is a semi-enclosed basin located off the coast of Southern California on the Northeast Pacific margin of North America. Due to coastal upwelling, this is one of the most productive regions in the world (Antoine et al. 1996). Seasonal upwelling intensifies in the summer, when northerly trade winds enhance input of cold and less saline upwelled waters from north of Point Conception to the Santa Barbara Basin (Lynn & Simpson 1987). When northerly winds weaken in the winter, the intensified California Undercurrent enhances input of warm waters to the basin from the south. The sediment trap was moored in the central part of the Santa Barbara Basin from May 1995 to March 1997 (Bringué et al. 2013). During the deployment period SST fluctuated from ∼9 to 19 °C, with the lowest temperatures recorded from mid-January to July. The intervals of active upwelling were characterized by cooler SSTs and weaker stratification of the upper water column. In contrast, the intervals of relaxed upwelling (from August to mid-January) were characterized by warmer waters with stronger stratification of the upper water column. In 1995–1997, SSSs only ranged from 33 to 34 psu. The trap sampling intervals lasted from 6 to 15 days, with an average of 14 days (Table 1). Two high-resolution multi-year dinoflagellate cyst time series were collected in estuarine waters of the Salish Sea on the west coast of British Columbia, Canada (Figure 1). The first trap was deployed in the central part of the Strait of Georgia from March 1996 to January 1999 (Pospelova et al. 2010). The second trap was moored from November 2007 to February 2010 in Saanich Inlet on southern Vancouver Island (Price & Pospelova 2011). Despite the fact that the distance between the two sites is only ∼50 km, hydrology and phytoplankton dynamics at these locations are very different. The Strait of Georgia is a semi-enclosed narrow basin which receives nutrient rich water from the Fraser River, and from the Pacific Ocean via the Juan de Fuca Strait to the south. (Thomson 1981). The basin waters are strongly stratified throughout the year due to large Fraser River inflow and precipitation. During the sampling period the average SST varied from 7–8 °C in February to 17–18 °C in August and SSS ranged from 19 to 29 psu (Pospelova et al. 2010). Sampling intervals ranged from 8 to 28 days, averaging 11 days (Table 1). Saanich Inlet is a fjord-type estuary with restricted deep-water circulation, promoting anoxic bottom waters during most of the year in the central part of the inlet. The inlet is characterized by surface water stratification and low vertical mixing due to weak winds and tidal currents. These conditions together with periodic nutrient influxes to the inlet create stable conditions favourable for phytoplankton growth. Saanich Inlet SSS is influenced by Cowichan River discharge during fall and winter and by Fraser River discharge in summer. During the study period SSS varied from 13 to 30 psu and SST changed from 3 °C in winter to 21 °C in summer (Price & Pospelova 2011). Collecting intervals in Saanich Inlet spanned from 0.5 to 19.5 days, with an average of 7 days (Table 1). Omura Bay is a shallow highly enclosed bay located in the western part of Kyushu Island, Japan (Fujii & Matsuoka 2006). Water exchange between the bay and the East China Sea is limited by two narrow straits, leading to extremely low tidal currents in the bay and stratified waters (Takahashi et al. 2009). Omura Bay is mesotrophic to eutrophic throughout the year and is characterized by summer hypoxic conditions in some parts of the bay (Takahashi et al. 2009). The sediment trap operated from July 1998 to June 2000 in the southern part of the Bay, a site that is in close proximity to the small Nagayo River (Fujii & Matsuoka 2006). During the trap deployment period SSS varied from 9 to 38 psu and SST ranged from 9 to 29 °C with clear seasonal trends. Sampling intervals in Omura Bay ranged from 4 to 27 days, averaging 14 days (Table 1). Hudson Bay is a seasonally ice-covered inland sea located in subarctic Canada and is the only region where a continuous sequence of seasonal dinoflagellate cyst production was reported from a sea-ice-covered area (Heikkilä et al. 2016). Here we provide a Spiniferites time series from a sediment trap moored in the southeastern part of Hudson Bay from October 2005 to September 2006 (Heikkilä et al. 2016). During this period the ice-covered winter season lasted from mid-December to mid-May and the fully ice-free period continued from July to October. The southeastern part of the bay receives a noticeable freshwater input from ice melt and Great Whale River discharge in spring. This part of Hudson Bay is oligo- to mesotrophic and is characterized by the warmest waters in the bay during the open-water season (Heikkilä et al. 2014, 2016). Even though SSTs and SSSs were not measured at the site, Heikkilä et al. (2016) believe that the highest SST could reach up to 12 °C during the warmest week of the year and average SSSs should be ∼29 to 30 psu during the ice-free season based on measurements conducted in the area. Sampling intervals in Hudson Bay ranged from 15 to 90 days, averaging 30 days (Table 1). A total of 66 surface sediment samples (0–1 cm) from well-dated cores were used to document Spiniferites sediment fluxes from upwelling influenced regions off NW and SW Africa (37 sites) and the Arabian Sea (16 sites) (Zonneveld et al. 2007), as well as from Hudson Bay (13 sites) (Heikkilä et al. 2014). Sedimentation rates at these sites were estimated based on 210Pb/137Cs and 14C dating methods. Details on the dating methods and calculations of cyst accumulation rates at each site can be found in Heikkilä et al. (2014) and Zonneveld et al. (2007). After collection the trap samples were wet-split. More details can be found in Zonneveld & Brummer (2000), Susek et al. (2005), Fujii & Matsuoka (2006), Pospelova et al. (2010), Zonneveld et al. (2010), Price & Pospelova (2011), Bringué et al. (2013), Heikkilä et al. (2016) and references therein. Prior to palynological processing, splits of all sediment trap samples were desalted, dried and weighed to avoid the effect of water content on dinoflagellate cyst flux estimates. One or more tablets of Lycopodium spores were added to each sample as a spike (e.g. Mertens et al. 2009, 2012; Price et al. 2016) to determine dinoflagellate cyst fluxes in the Strait of Georgia (Pospelova et al. 2010), Saanich Inlet (Price & Pospelova 2011), the Santa Barbara Basin (Bringué et al. 2013) and Hudson Bay (Heikkilä et al. 2016). No Lycopodium spores were added to the samples from the Arabian Sea (Zonneveld & Brummer 2000), off Cape Blanc (Zonneveld et al. 2010), or Omura Bay (Fujii & Matsuoka 2006), as the volumetric method was used to estimate cyst fluxes at those locations (e.g. Dale et al. 2002). Fluxes were calculated by dividing the number of cysts collected per square metre by the number of days in each sampling interval (cysts m−2 day−1). To concentrate dinoflagellate cysts, the trap samples were subsequently processed using comparable palynological preparation techniques that include acid treatments and sieving of sediments (Table 1). The acid treatments involved the use of room-temperature hydrochloric acid (10% HCl) to dissolve carbonates and hydrofluoric acid (25–48% HF) to dissolve silicates. The sieving step removed coarse and fine sediment particles that are larger or smaller than most of organic-walled dinoflagellate cysts (from ∼20 to ∼100 µm). Sediment trap samples from the Arabian Sea and off Cape Blanc were sieved only through 20 µm high precision Stork-Veco sieves (Zonneveld et al. 2007), whereas samples from Omura Bay were sieved through ∼20 µm and 125 µm interlaced metal sieves (Matsuoka et al. 1989). Samples from the Strait of Georgia, Saanich Inlet, Santa Barbara Basin and Hudson Bay sediment traps were treated using the processing technique of Pospelova et al. (2010) that includes sediment sieving through ∼15 µm and ∼120 µm nylon mesh. The residues were strew-mounted in glycerine jelly between a slide and cover slip. Dinoflagellate cysts were identified according to Zonneveld & Pospelova (2015) and counted using transmitting light microscopes at ×400 to ×1000 magnifications. Cysts were counted as cysts with cell content (considered to be recently produced) and cysts without cell content (cysts that have excysted). A Nikon Eclipse 80i microscope and coupled Nikon DS camera head (DS-Fi1)/DS with camera control unit DS-L2 (Nikon, Japan) were used at the Paleoenvironmental Laboratory (University of Victoria, Canada) to take photomicrographs of Spiniferites from the Strait of Georgia, Saanich Inlet, Hudson Bay, the Santa Barbara Basin, and Omura Bay. A Zeiss Axioskop2 microscope and AxioCam MRc5 digital camera were used to obtain photomicrographs of Spiniferites from the Arabian Sea and off Cape Blanc at MARUM (Center for Marine Environmental Sciences, University of Bremen, Germany). All cyst images were taken under ×100 oil immersion objectives. Surface sediment samples were treated following the same protocol as the sediment trap samples (see details in Zonneveld et al. 2007). Cyst sediment fluxes were calculated accordingly: cysts m−2 day−1 = cysts g−1 × g m−3 × m day−1, where g is weight of dried sediment sample in grams. Out of all 403 analysed sediment trap samples from eight sites, 276 samples contain cysts of Spiniferites. The highest Spiniferites fluxes are reported in Saanich Inlet, followed by Omura Bay, Hudson Bay, Santa Barbara Basin, Arabian Sea, Strait of Georgia and off Cape Blanc (Figure 2). Average daily total Spiniferites cyst fluxes in Saanich Inlet (208,200 cysts m−2 day−1) are one order of magnitude higher than those in Omura Bay (23,818 cysts m−2 day−1), with the latter being one order of magnitude higher than those in Hudson Bay (6,867 cysts m−2 day−1). Average daily total Spiniferites fluxes in the Santa Barbara Basin are comparable to the fluxes at the near shore site (MST-8) in the Arabian Sea, with an average of 902 and 609 cysts m−2 day−1, respectively (Figures 2 and 3). The fluxes in the Strait of Georgia and the offshore site (MST-9) in the Arabian Sea averaged ∼30 to 50 cysts m−2 day−1, while off Cape Blanc only occasional and almost negligible Spiniferites fluxes (∼1 cysts m−2 day−1) were recorded. In general, when the average daily total Spiniferites cyst fluxes in the traps are plotted on a map of world annual primary productivity distribution, it becomes evident that total Spiniferites fluxes are greater in coastal and estuarine regions of high primary productivity, as reflected by high surface water chlorophyll a concentrations (Figure 4). The major exception for this case is low average daily total Spiniferites fluxes in the productive Strait of Georgia. In agreement with the average daily total Spiniferites fluxes in the traps, the relative abundance of Spiniferites is highest in Saanich Inlet (28.0%), followed by Omura Bay (5.1%), Hudson Bay (4.5%), the Arabian Sea (3.5% and 4% at MST-8 and MST-9, respectively), the Santa Barbara Basin (1.3%), the Strait of Georgia (0.5%), and off Cape Blanc (0.1%) (Figure 5). There is a positive and significant linear correlation between log-transformed total Spiniferites fluxes and their log-transformed relative abundances in the traps' assemblages (R2 = 0.78; p < 0.004) (Figure 6). Both parameters were log-transformed to reduce the variability or skewness of the data and for easier visualization. Data on surface sediment Spiniferites fluxes are not available for all sediment trap site regions. Nonetheless, we provide this information for the Arabian Sea, Hudson Bay, the South Atlantic Ocean from off the northwest (NW) and the southwest (SW) of Africa. The highest total Spiniferites fluxes in surface sediment samples can be observed in the regions of active upwelling: off Somalia (up to 600,000 cysts m−2 day−1), SW Africa (up to 380,000 cysts m−2 day−1), and NW Africa (∼140,000 cysts m−2 day−1) (Figure 7). The total Spiniferites sedimentary cyst fluxes appeared to rapidly decrease in an offshore direction and become at least three orders of a magnitude lower at the edge of active upwelling cells. Spiniferites cysts were not observed in the surface sediment samples from the offshore oligotrophic sites along the SW and NE Africa. The following Spiniferites are identified in the eight sediment traps: Spiniferites spp., S. bentorii, S. bulloideus, S. elongatus, S. hyperacanthus, S. membranaceus, S. mirabilis, S. pachydermus, and S. ramosus. Figure 8 shows the total number of identified Spiniferites species, including Spiniferites spp., and the relative abundances of individual species of Spiniferites in the traps. The highest number of species is reported from Saanich Inlet (6), at the site with the highest cyst fluxes (Figure 8). Most of the other traps contain three to four different Spiniferites species, with the lowest number (two) recorded in the Strait of Georgia. Not surprisingly, Spiniferites spp. is found at all locations (Figure 8). One of the most common species of Spiniferites, S. ramosus, is reported from all sites with the exception of Omura Bay and off Cape Blanc (Figure 8). Due to similarities between S. bulloideus and S. ramosus, further taxonomic studies of Spiniferites species occurring in Omura Bay should be conducted. Interestingly, S. bentorii is found only in Saanich Inlet (Figure 9). S. mirabilis is documented from most of the traps, with the exception of the Strait of Georgia and Hudson Bay, and has the highest cyst fluxes in Omura Bay (Figure 10). Rare occurrences of S. membranaceus are reported in Saanich Inlet and off Cape Blanc; and S. hyperacanthus is only identified in Omura Bay (Figure 8). S. pachydermus is noted in low numbers in the Arabian Sea, Santa Barbara Basin, and off Cape Blanc (Figure 8). S. elongatus is observed in two traps, with the highest abundances in the Hudson Bay and with a rare presence in Saanich Inlet (Figure 8). Thus, the warm water affinity Spiniferites species (S. mirabilis, S. hyperacanthus, and S. pachydermus) are found at mid- and low- latitude sites, whereas colder water S. elongatus cysts are reported in higher fluxes from the high-latitude site with a seasonal ice cover, Hudson Bay. Individual Spiniferites fluxes, as well as total Spiniferites fluxes, from each sediment trap are shown in Figures 3, 9–14. The most striking observation is that all Spiniferites species have a tendency to be present, increase, or decrease at the same time in each individual trap, e.g. the trends are very similar for all Spiniferites species in any given trap but not in-between the traps. Thus, due to such consistency, changes in total Spiniferites fluxes can be used to describe seasonal trends of all individual Spiniferites species that were observed at each site. There are minor variations from this trend in a few samples, mostly when cyst counts are very low and/or Spiniferites fluxes are negligible (e.g. off Cape Blanc, the offshore site MST-9 in the Arabian Sea, and the Strait of Georgia) and thus inconclusive. Our results demonstrate that Spiniferites cyst production can occur continuously throughout a year (e.g. Saanich Inlet, Santa Barbara Basin, and Arabian Sea MST-8) or be limited to a specific time interval (e.g. Omura Bay, Hudson Bay, and Cape Blanc) (Figures 10, 14, and 11). The timing of the highest and/or the lowest Spiniferites fluxes can be easily distinguished in all studied sediment trap time series. The highest total Spiniferites fluxes are observed during winter in Saanich Inlet, winter and spring in the Strait of Georgia, spring and fall in Omura Bay and off Cape Blanc, fall in the Arabian Sea, and late summer and fall in Santa Barbara Basin and Hudson Bay (Figures 3,9–14). Thus, there is not one specific season (spring, summer, fall, or winter) between the studied sites when Spiniferites cyst production prevails, even though all our sites are from the Northern Hemisphere. However, Spiniferites production at each individual location reflects the seasonal cycle of local environmental conditions. In general, the increased fluxes of total Spiniferites, and especially increases of cyst fluxes with cell content, are observed during the intervals of the most pronounced environmental change that can be reflected by changing SST and/or SSS values. In the Santa Barbara Basin and Arabian Sea, the increased cyst fluxes are recorded during the intervals of increasing SSTs (Figures 3 and 13). In these regions, increasing SST is the result of seasonal upwelling relaxation. The highest peak of total Spiniferites fluxes is observed after a sharp SSS drop in Omura Bay. Spiniferites cyst production in Hudson Bay does not occur during the period of seasonal sea-ice cover (Figure 14). Multiyear sediment trap Spiniferites fluxes are only available from three estuarine sites (Strait of Georgia, Saanich Inlet and Omura Bay) and one coastal site (Santa Barbara Basin), as well as one offshore (Cape Blanc) site (Figures 9–13). At the off Cape Blanc site (Figure 11), Spiniferites fluxes were extremely and consistently low during three years (1989, 1991, and 1998) and cysts were not recorded in the other two years (1990 and 1999) (Susek et al. 2005; Zonneveld et al. 2010). All other sediment trap time series show clear interannual variability of total Spiniferites fluxes. Omura Bay total Spiniferites fluxes in the fall of 1998 and 1999 appear to be comparable, but their cyst production patterns are different (Figure 10). During fall of 1998 Spiniferites cyst fluxes were uniform though the season, with an average of ∼33,950 cysts m−2 day−1. In the fall of 1999 cysts fluxes were at least twice lower on average and with one noticeable peak in October 1999 (∼207,240 cysts m−2 day−1). This peak was mostly due to an increase in S. hyperacanthus, and occurred right after a sharp drop in SSS. Total Spiniferites fluxes were much higher in spring and early summer of 1999 in comparison to spring 2000 (Figure 10), thus highlighting interannual variability of Spiniferites cyst production in this bay. Undoubtedly, one of the largest year-to-year variability in Spiniferites production is recorded for the British Columbian estuaries, especially Saanich Inlet (Figure 9). Here, the fluxes of Spiniferites, particularly S. ramosus, were three times higher in the winter of 2007/08 in comparison to 2008/09 and 2009/10 winters. The highest Spiniferites production in the neighbouring Strait of Georgia was reported in winter and spring of 1998 (Figure 12). Fluxes during this year were almost five times higher than those in the previous years. Total Spiniferites fluxes in the Santa Barbara Basin were slightly higher in 1996, in comparison to 1995, but interannual variability of total Spiniferites fluxes was not as strikingly different in this basin as it was at other locations. During both years, the highest Spiniferites fluxes in the Santa Barbara Basin were recorded during intervals of increasing SSTs in late summer and fall (Figure 13), when upwelling conditions become relaxed (Bringué et al. 2013). This paper presents a synthesis of Spiniferites fluxes based on eight sediment trap time series from seven regions in the Northern Hemisphere. These sediment trap samples were collected by different sediment traps and processed in three laboratories, each using slightly different cyst extraction techniques and cyst flux estimation methods (Table 1). The use of different trap models (Dale 1998) and sediment treatment methods could lead to some discrepancies in the cyst flux estimates. For instance, the volumetric method used on Omura Bay, Arabian Sea and off Cape Blanc trap samples could provide lower cyst flux estimates compared to the Lycopodium spiked method used for all four North American traps (Dale 1976; Mertens et al. 2009). However, previous studies (Dale 1976; Mertens et al. 2009) that compared the effect of these different flux estimation techniques have indicated that the methodological differences should not lead to several orders of magnitude changes in the cyst fluxes, as we observe it in the present study. In addition, when data from the same laboratory are compared (e.g. Strait of Georgia, Saanich Inlet and Hudson Bay), it can be seen that Spiniferites fluxes vary greatly from site to site, thus reflecting large differences in local cyst fluxes and not the flux estimation method. Therefore, we assume that the reported ranges in the cyst fluxes reflect large differences in natural cyst production in the upper water column rather than methodology-induced non-uniformity. One of the most compelling observations in this study is that cyst fluxes of all Spiniferites species increase or decrease in a similar manner in each sediment trap time series. This could be caused by large intraspecific morphological variations and/or similarities in environmental response. In the first case, different Spiniferites cyst species in each sediment trap would represent morphological end-members of the same biological species. In the second case, different species of this genus would react similarly to the changes in environmental conditions at each site. Genetic and laboratory culture studies of several Spiniferites species revealed that different Spiniferites cyst species are produced by different motile stages (e.g. Ellegaard et al. 2003; Mertens et al. 2015). Thus, the second scenario suggesting that different Spiniferites species react in a similar way to the changing environmental parameters is the most plausible. Nevertheless, more Spiniferites culture experiments and cyst-motile stage relationship studies are required to corroborate our conclusion and to explain the observed cyst production patterns. All Spiniferites species observed in the sediment trap samples were reported from surface sediment samples at each site (Zonneveld & Brummer 2000; Susek et al. 2005; Fujii & Matsuoka 2006; Pospelova et al. 2010; Zonneveld et al. 2010; Price & Pospelova 2011; Bringué et al. 2013; Heikkilä et al. 2014, 2016). However, not all Spiniferites species that were previously observed in the surface sediments from these regions are recorded in the sediment trap samples. For example, in agreement with modern geographic distributions of S. elongatus in surface samples (see e.g. Zonneveld et al. 2013; de Vernal et al. 2018), this species is observed in the sediment trap samples from Hudson Bay and Saanich Inlet. However, despite the fact that S. elongatus was previously documented in the surface sediments from the Strait of Georgia, the Santa Barbara Basin and Omura Bay (e.g. Zonneveld et al. 2013), it is not reported in the studied sediment trap samples from these locations. In contrast, S. bentorii is only observed in the sediment trap and sediment samples from Saanich Inlet, although it was also reported in low relative abundances in surface samples from the Santa Barbara Basin, the Arabian Sea, Omura Bay, and off Cape Blanc (e.g. Zonneveld et al. 2013). Likewise, S. membranaceus is observed only in the sediment traps from Saanich Inlet and off Cape Blanc, even though it was found in surface sediment samples from the Santa Barbara Basin and Omura Bay (e.g. Zonneveld et al. 2013). A likely explanation could be that on average a surface sediment sample represents a much longer sampling interval than our sediment trap records. Our sediment trap samples were collected for up to five years, whereas surface sediment samples may represent years to centuries of sediment accumulation (e.g. Zonneveld et al. 2013). This assumption is supported by the observation that when sediment samples represent approximately the same time interval as the one recovered by the sediment trap time series, there is a good match between the species presence and abundances in the traps and the corresponding dated sediment samples (Pospelova et al. 2010; Price & Pospelova 2011; Bringué et al. 2013; Heikkilä et al. 2016). Another important observation of this study is that there is no uniform seasonal pattern in Spiniferites cyst production among the studied sediment trap sites. Despite the fact that there is not one specific season when Spiniferites production prevails at all eight locations, we observe that the timing of elevated total Spiniferites fluxes coincides with intervals of local seasonal environmental change at each location. Unfortunately, we do not have direct measurements of nutrient availability or chlorophyll a data for the duration of the sediment trap deployments, but in-between site comparison implies an important role of nutrient availability on the total Spiniferites fluxes. The average daily total Spiniferites cyst fluxes appear to be greater in coastal and estuarine waters with high marine primary productivity, compared to the offshore sites (Figure 2). This trend can be observed in both traps and surface sediment samples, with sites with the highest Spiniferites fluxes being located in the regions with the highest upper water chlorophyll a measurements (Figures 2 and 4). High chlorophyll a values are, in turn, strongly related to the availability of nutrients in the upper water column as a result of coastal upwelling (Figures 4 and 7). This indicates that there might be a positive relationship between total Spiniferites cyst production and availability of nutrients in the upper water column. Thus, nutrient availability is likely to be one of the most important environmental parameters driving Spiniferites spatial distributions and their total cyst fluxes. However, nutrient availability appears not to be the only factor influencing Spiniferites cyst production. When individual sediment trap time series are compared, we find that the timing of elevated total Spiniferites fluxes coincides with intervals of changing environmental conditions that are directly or indirectly reflected by changing SST and/or SSS (Figures 3 and 9–13). It is important to note that the highest total Spiniferites fluxes do not match with the highest or lowest SSTs or SSSs at each site. For instance, the already high Spiniferites cyst fluxes recorded from the Santa Barbara Basin increase in late summer and fall of 1996 during the intervals of increasing SST (Figure 13). These increased SST intervals correspond to the phase of relaxed upwelling, when sea-surface waters become generally warmer, more stratified, with minimal turbulence, and nutrients are still available. This might therefore imply that a combination of factors such as high nutrient availability and reduced upper water turbulence might provide the most favorable conditions for Spiniferites cyst production. A similar trend is observed in the NW Arabian Sea, where Spiniferites fluxes increased in fall 1992, when the SW monsoon upwelling subsided (Figure 3). Fluxes decreased when nutrient availability decreased in the inter-monsoonal and NE monsoon seasons. We do not observe high total Spiniferites fluxes in the sediment trap series from off Cape Blanc (Figure 11). The trap is located far away from the active upwelling cells and this site is only sporadically reached by the upper water upwelling filaments. An additional source of nutrients to this site is dust that can be sporadically transported to this region by enhanced northeast trade winds. However, for the majority of the year the upper water nutrient availability is extremely low at this site (Zonneveld et al. 2010). We consider that this is the most likely limiting factor for Spiniferites production at this location. The general pattern of Spiniferites fluxes in Omura Bay allows us to conjecture that the increased cyst production can be associated with the intervals when extreme water column stratification ends by wind mixing of hypoxic waters in this shallow estuary. Such locally occurring fall and spring events lead to increased nutrient input in Omura Bay at least twice a year. A peak of very high Spiniferites fluxes was observed in October 1999, right after a sharp drop in SSS (Figure 10). This major salinity change at the trap site can only be explained by increased Nagayo River discharge due to an abrupt precipitation event. Such discharge would not only lower SSS in the estuary, but also bring additional nutrients from the agriculturally developed watershed. Based on the analyses of all eight sediment trap time series, we conclude that a combination of factors is required to obtain optimal conditions for Spiniferites cyst production at each site. If one of the factors is not optimal, it limits cyst production. This can be demonstrated by comparing our data from two sediment traps in British Columbian waters (Figures 9 and 12). The Saanich Inlet sediment trap records average daily total Spiniferites cyst fluxes that are four orders of magnitude higher than those in the Strait of Georgia, despite the close proximity of these two sites (Figure 2). Both SST and SSS ranges are comparable (Figure 15) and nutrient inputs are plentiful at both locations. The major difference for these sites is their distance to and the influence of the Fraser River discharge. Despite the fact that the Fraser River produces a strongly stratified water column throughout the year in the southern part of the Strait of Georgia, it also produces a turbid plume spanning to the location of the sediment trap site (Johannessen et al. 2005). This turbid plume contains a large number of suspended particles and most likely limits the population growth of phototropic dinoflagellates such as Spiniferites cyst producing dinoflagellates. Thus, the turbid waters of the Fraser River are most likely the major factor causing low Spiniferites fluxes in the Strait of Georgia through a year and possibly limiting them in Saanich Inlet during all but winter season, when the Fraser River discharge is minimal. Another important factor that could potentially limit phototrophic dinoflagellate production is the sea-ice-cover. Hudson Bay is the only location with seasonal sea-ice cover where dinoflagellate cyst fluxes were studied from sediment trap samples (Heikkilä et al. 2016). It is not surprising that Spiniferites fluxes were minimal or absent during the dark boreal winter and sea-ice cover season (Figure 14). In Hudson Bay, Spiniferites cysts were not produced during the entire sea-ice free interval, but rather only in the second half of summer 2006 and fall 2005. Since, we do not have SST and SSS measurements for the duration on this sediment trap deployment, we cannot speculate on the direct influence of these parameters on Spiniferites fluxes in Hudson Bay. Nevertheless, the confirmation of the absence of Spiniferites production under the sea-ice is reassuring. From all of the above, we can infer that an increase in Spiniferites cyst production occurs concurrently with intervals of local environmental change, e.g. when surface waters contain high concentrations of nutrients and the upper water column is becoming more stable or stratified. In the upwelling regions this coincides with an increase in SSTs. It can be argued that if such conditions persist longer during a year and vary from year to year, the cyst production might stay high for a longer period, thus ultimately leading to increased annual and interannual Spiniferites fluxes at that site. The most striking interannual variability is recorded from the Strait of Georgia and Saanich Inlet (Figures 9 and 12). In the Strait of Georgia, the average daily total Spiniferites fluxes were almost five times higher in 1998 compared to previous years. The 1997/98 El Niño event was responsible for the unusually warm winter and early spring of 1998 that led to the prolonged increased production of dinoflagellate cysts and diatoms in the Strait of Georgia (Pospelova et al. 2010). The highest Spiniferites production in the neighbouring Saanich Inlet was three times higher in winter 2007/08 in comparison to winters of 2008/09 and 2009/10. That particular winter was warmer than usual and with slightly lower than normal SSS (Price & Pospelova 2011) due to the 2007/08 La Niña event. In contrast, we observe only small interannual variability of total Spiniferites fluxes in the Santa Barbara Basin (Figure 13). The two studied years were characterized by similar environmental conditions, e.g. very comparable SSTs and the duration of relaxed upwelling in the Santa Barbara Basin. The years recovered in the trap preceded the very strong El Niño event of 1997/98 (Bringué et al. 2013), thus one should expect to see large interannual variability at this site in the Santa Barbara Basin in the following years. Our results demonstrate that Spiniferites cyst production is strongly related to the timing and intensity of local environmental change or some instability in a system. It is important to point out that a combination of optimal factors or specific environmental conditions are required to enhance Spiniferites cyst production in each region. Evidently, a single or multiple limiting factors that trigger cyst production can vary from year to year and from site to site. This should be taken into account when seasonal or monthly water quality parameters (e.g. SSTs, SSS, sea-ice covers, nutrients, primary productivity, etc.) are matched to specific cyst taxa from surface sediments in regional, hemispheric, or global databases (e.g. de Vernal et al. 2001, 2005; Pospelova et al. 2008; Radi & de Vernal 2008; Marret & Zonneveld 2003; Zonneveld et al. 2013; Bonnet et al. 2012). This work performs a comparative review of previous findings on the seasonal dynamics of Spiniferites cyst production in different geographic regions. It highlights the importance of sediment trap studies, and a need for inter-site comparison. This is the first such attempt, and it was done using an easily preservable and identifiable genus. We compiled and compared eight sediment trap time series from the Northern Hemisphere. Our study demonstrates how sediment traps, especially those from coastal settings, can be used to measure in situ cyst production and to determine the environmental conditions under which Spiniferites are formed. The most important finding of our analysis is that seasonal, annual, and inter-annual patterns of Spiniferites cyst fluxes are specific to each location, and thus are spatially variable. There is not one particular season when Spiniferites cyst production prevails in the studies of eight geographically distant locations (e.g. winter in Saanich Inlet, winter and spring in the Strait of Georgia, spring and fall in Omura Bay and off Cape Blanc, fall in the Arabian Sea, and late summer and fall in Santa Barbara Basin and Hudson Bay). Nevertheless, the timing of elevated total Spiniferites fluxes coincides with intervals of local seasonal environmental change at each site. In all studied sediment trap records we observe that cyst fluxes of all Spiniferites species at any given location increase or decrease simultaneously. This is a strong indication that individual Spiniferites species react in a similar way to environmental triggers. Furthermore, average daily total cyst fluxes, recorded in the sediment trap series and the cyst fluxes determined in surface sediment samples, appear to be greater in coastal and estuarine waters with high upper water marine primary productivity. This suggests that nutrient availability is a major factor stimulating Spiniferites production. Our study suggests that other important requirements for this genus to thrive are some degree of upper water column stratification (or rather its stability), low turbidity, and ice-free conditions under a wide range of SST and SSS. Regardless of the paucity of sediment trap studies and some discrepancies in sampling methods, such studies make a valuable contribution to dinoflagellate cyst ecology and reveal seasonal and inter-annual trends in cyst production that vary widely in estuarine, coastal, and open ocean settings. Despite the fact that only four multi-year time series that yield adequate Spiniferites counts are currently available worldwide, they document strong interannual variability in the cyst fluxes when environmental conditions vary between the years. When surface water environmental conditions were similar in-between studied years, the total cyst fluxes and their temporal variation were comparable. This interannual variability reflects environmental changes. For instance, in the Strait of Georgia and Saanich Inlet it may be related to the occurrence of El Niño/La Niña climatic events. Thus, seasonality of Spiniferites is defined by optimal environmental conditions that are site specific and the limiting factor(s) can vary from year to year and from site to site. Major differences in seasonal preferences of Spiniferites fluxes at different locations in estuarine waters (e.g. in the Salish Sea) suggest that even a “regional” modern dinoflagellate cyst database should be used with some caution in highly heterogeneous estuarine systems, especially when inferences of seasonal or monthly paleo- SST or SSS are made. In addition, this work demonstrates the importance of local sediment trap studies, and it also highlights some difficulties in this direction of dinoflagellate cyst research. For future studies, we highly recommended collecting measurements of water quality parameters for the entire duration of a sediment trap deployment. This research would also greatly benefit from parallel phytoplankton observations in the water column at each sediment trap site, whenever it is possible (see Wall & Dale 1968; Dale 1983). Nonetheless, studies of seasonal, annual, and inter-annual cyst production in relation to environmental factors also provide insights on ecology of motile counterparts and should be used in conjunction. We are grateful to B. Dale, K.N. Mertens, and one anonymous reviewer for their constructive comments and suggestions. Map showing locations of sediment traps used in this study with respect to the world’s oceans. Six inserts display the mooring sites and nearby bathymetry (m) from http://www.gebco.net/. Saanich Inlet (SI) and the Strait of Georgia (SofG). Comparison of average daily total Spiniferites cyst fluxes at each sediment trap site. Saanich Inlet (SI), Strait of Georgia (SofG) and Santa Barbara Basin (SBB). Map of the northwestern Arabian Sea showing the locations of two sediment traps (see Figure 1 for bathymetry colour legend). The pie diagram shows the relative abundance of all Spiniferites (purple) in the total cyst assemblage. The top panel provides daily average sea-surface temperatures (red). Time-series of all and individual Spiniferites fluxes (cysts ×103 m−2 day−1). The bright-field photomicrographs of Spiniferites mirabilis (A) and S. pachydermus (B) from the traps are shown with 10 µm scale bars. 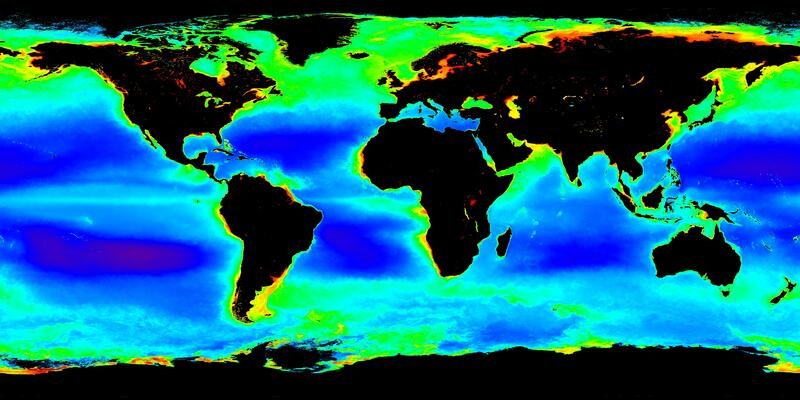 Map showing the distribution of marine annual chlorophyll a concentrations (from the MODIS instrument on NASA’s AQUA spacecraft; http://www.nasa.gov/images/content/107324main_map.jpg) and eight sediment trap sites (open white circles). Relative abundances of Spiniferites (in blue) in the total dinoflagellate cyst assemblage from the sediment trap samples. Relationship between average daily total Spiniferites fluxes (cysts m−2 day−1) and relative abundances (%) of Spiniferites in the total dinoflagellate cyst assemblage from each sediment trap (Saanich Inlet (SI), Omura Bay (OB), the Santa Barbara Basin (SBB), the Strait of Georgia (SofG), Hudson Hay (HB), off Cape Blanc (CB), and the Arabian Sea (sites AS-MST-8 and ASMST-9)). Both parameters were log-transformed and the coefficient of determination (R2) is calculated after a linear regression. Total Spiniferites fluxes (cysts ×103 m−2 day−1) in dated surface sediments (A–D) are compared to mean annual upper water chlorophyll a concentrations (E–H, F, G, H) in the upwelling influenced areas off NW and SW Africa (A, B, E, F) (Holzwarth et al. 2007; Zonneveld et al. 2010) and the Arabian Sea (C, G) (Zonneveld et al. 2007), as well as the subarctic Hudson Bay (D, H) (Heikkilä et al. 2014). Chlorophyll a images are from http://giovanni.gsfc.nasa.gov/giovanni. Relative abundances of individual Spiniferites taxa in the sediment traps. The number inside of each pie diagram represents the number of identified Spiniferites species and Spiniferites spp. at each site. Map of Vancouver Island (BC, Canada) showing the location of the sediment trap in Saanich Inlet (see Figure 1 for bathymetry colour legend). The pie diagram shows the relative abundance of all Spiniferites (in purple) in the total cyst assemblage. The two top panels provide daily average sea-surface temperatures (red) and sea-surface salinities (blue). Time-series of all and individual Spiniferites fluxes (cysts ×103 m−2 day−1) are shown with (black) and without cell content (gray). The bar located above the cyst fluxes shows when the sediment trap was not operational (black). Bright-field photomicrographs of the most common Spiniferites at the site are shown at the bottom. Spiniferites ramosus (A–B), S. spp. (C–E), and S. bentorii (F). All scale bars =10 µm. Map of Kyushu Island (Japan) showing the location of the sediment trap in Omura Bay (see Figure 1 for bathymetry colour legend). The pie diagram shows the relative abundance of all Spiniferites (in purple) in the total cyst assemblage. The two top panels provide daily average sea-surface temperatures (red) and sea-surface salinities (blue). Time-series of all and individual Spiniferites fluxes (cysts ×103 m−2 day−1) are shown with (black) and without cell content (gray). Bright-field photomicrographs of the most common Spiniferites at the site are shown at the bottom. Spiniferites hyperacanthus (A), scale bar =10 µm. Map of northwestern Africa showing the location of the sediment trap off Cape Blanc (see Figure 1 for bathymetry colour legend). The pie diagram shows the relative abundance of all Spiniferites (in purple) in the total cyst assemblage. The two top panels provide daily average sea-surface temperatures (red) and sea-surface salinities (blue). Time-series of individual Spiniferites fluxes (cysts ×103 m−2 day−1). The bright-field photomicrograph of Spiniferites mirabilis (A) from the trap is shown with a scale bar =10 µm. Map of Vancouver Island (BC, Canada) showing the location of the sediment trap in the Strait of Georgia (see Figure 1 for bathymetry colour legend). The pie diagram shows the relative abundance of all Spiniferites (in purple) in the total cyst assemblage. The three top panels provide daily average Fraser River discharge (black), sea-surface temperatures (red) and sea-surface salinities (blue). Time-series of all and individual Spiniferites fluxes (cysts ×103 m−2 day−1) shown with (black) and without cell content (gray). The bar located above the cyst fluxes shows when the sediment trap was not operational (black). Bright-field photomicrographs of the most common Spiniferites at the site are shown at the bottom. Spiniferites spp. (A) and S. ramosus (B–E). All scale bars =10 µm. Map of the Santa Barbara Basin (California, USA) showing the location of the sediment trap mooring site (see Figure 1 for bathymetry colour legend). The pie diagram shows the relative abundance of all Spiniferites (in purple) in the total cyst assemblage. The two top panels provide daily average sea-surface temperatures (red) and sea-surface salinities (blue). Time-series of all and individual Spiniferites fluxes (cysts ×103 m−2 day−1) are shown with (black) and without cell content (gray). The bar located above the cyst fluxes shows when the sediment trap was not operational (black). Bright-field photomicrographs of the most common Spiniferites at the site are shown at the bottom. Spiniferites mirabilis (A), S. ramosus (B–C), S. pachydermus (D), and S. spp. (E). All scale bars =10 µm. Map of the Hudson Bay showing the location of the sediment trap (see Figure 1 for bathymetry colour legend). The pie diagram shows the relative abundance of all Spiniferites (in purple) in the total cyst assemblage. The two top panels depict the succession of sea-ice cover (SIC) (concentration in %), and sun light on top of the ice (irradiance in ×103 kJ m−2) at the site. Time-series of all and individual Spiniferites fluxes (cysts ×103 m−2 day−1) are shown with (black) and without cell content (gray). Spiniferites spp. (A), and S. elongatus (B–C) and S. ramosus (D–E). Bright-field photomicrographs of the most common Spiniferites at the site are all shown with scale bars =10 µm. Relationship between average daily total Spiniferites fluxes (cysts m−2 day−1) and sea-surface temperature (A) and sea-surface salinity (B) in the sediment trap samples from Saanich Inlet (SI), Omura Bay (OB), the Santa Barbara Basin (SBB), the Strait of Georgia (SofG), and off Cape Blanc (CB). Cyst fluxes are log-transformed. To avoid numerical inconsistencies, all data points with zero cyst fluxes were assigned a nominal flux of 1 cyst m−2 day−1, which gives 0 under logarithmic transformation. These points arrange themselves as a line at the bottom of the graphs. Summary of sediment trap and mooring site information, time of deployments, cyst extraction method, cyst counts, and the source of these data. Details on the exact latitude and longitude for each individual deployment can be found in the relevant publications. Environments are indicated as: O = offshore, C = coastal, E = estuarine. N33°00'00" - N33°00'00", E130°00'00" - E130°00'00"
N20°00'00" - N20°00'00", W20°00'00" - W20°00'00"
N55°00'00" - N55°00'00", W73°00'00" - W73°00'00"
N48°30'00" - N48°30'00", W123°15'00" - W123°15'00"
. Reconstruction of sea-surface conditions at middle to high latitudes of the Northern Hemisphere during the Last Glacial Maximum (LGM) based on dinoflagellate cyst assemblages.
. Distribution of organic-walled dinoflagellate cysts in shelf surface sediments of the Benguela upwelling system in relationship to environmental conditions.
. Spatial distribution of modern dinoflagellate cysts in polluted estuarine sediments from Buzzards Bay (Massachusetts, USA) embayments.